The crisis over the Indo-US nuclear deal appears to be over. In its wake, however, lie a number of questions that remain unanswered. These pertain mostly to the mix between domestic politics and Indian foreign policy. At such a time appears a book written by Prakash Karat, the general secretary of the Communist Party of India (Marxist). He is the man believed by many to be a major contributor to the crisis that just blew over. Subordinate Ally: The Nuclear Deal and India-US Strategic Relations seeks to answer questions about Indo-US relations that have thrown up a lot of dust. A collection of essays, and hence by nature uneven in texture, the book does not meet these expectations. Perhaps this unevenness has more to do with the fact that the book was written after the recriminations began. Published in September, the essays in the book show a clear intellectual division of labour. Those written in and after 2006 have an element of stridency and are more polemical. Those before that period try to project a slightly different world view. In that sense, the task of a reader is difficult, for one does not know where an exercise in knowledge ends and that in politics begins. A better way to come to grips with the text would be to read the essays in the book and compare them with contemporary events. The Left, which offered support to the coalition that came to power after the defeat of the National Democratic Alliance in 2004, was aware of this trend. 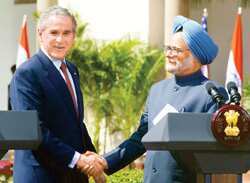 In his essay Will the UPA Redefine India-US Relations? written roughly two months after the new government was formed, Karat expressed a contrary hope. What was the basis for that assertion? Was mere association of Left parties with the new coalition sufficient for a change of course in foreign policy? If the Left felt strongly about growing Indian proximity to the US, what did it do about it? These questions are, sadly, left unanswered in Karat’s tract. If the Left’s anti-Americanism is well known, what is mystifying is the strategy adopted by these parties, if at all there was one, to force changes on a government that thought otherwise. There are no answers to that in this book. By the time the arguments against the US dry and the pages turn, Karat the politician takes over from Karat the writer. The time of the split between the Left and the change of tenor of the essays is broadly coeval. The bigger surprise is the sudden nature of the developments. The author spells the well-known arguments about the unacceptable nature of the course the UPA took on the foreign policy front. What he does not say is, why threaten now? Why not earlier, when the signals were equally clear? What calculations went behind the decision to precipitate matters? The question about the timing of the step may appear to be of journalistic interest alone, but it is not. It signals defeat for parties that wished otherwise. Even if the deal appears to be off for the moment, it cannot signal victory for the Left: It was the threat of pulling down the government that stopped it and not a change in outlook. This does mark defeat for a party that prides in dialogue and dialectics. Expecting answers to such questions is perhaps asking too much honesty from an Indian politician, however principled he may appear to be. One wishes the book had gone into comparative questions. For example, those about the relative success of the Left in blocking economic reforms and its failure in tuning foreign policy to the frequency it likes. Is it because foreign policy questions are far too complex to spur electoral resistance in the manner of economic issues? Does that mark the frontier of Leftist influence in government and politics beyond electoral issues? When one considers these questions in total, doubts arise. 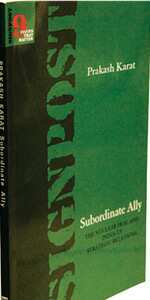 How does one differentiate between a book that may be of great propaganda value but does little to inform? Are well-written arguments merely clever? Karat’s book is prone to these doubts, while not answering questions that may come to the mind of any concerned citizen.